Depending on where you grew up, cooking lobster may be just as every day as cooking chicken but for others it may be a completely new undertaking. For some, the idea of cooking lobster can be a bit intimidating but follow some of these easy ideas and you will find it on your dining table in no time at all. The very simplest way to cook a lobster takes water, salt and optionally, a little piece of seaweed. Get the largest pot in the kitchen and fill it ¾ full of water then add salt. Boil the water up and add the seaweed if you are using this. Take the live lobster (they have to be alive when cooking) and put them in the pot. The best way to kill the lobster is to put it in the pot headfirst so they will be disorientated and die quickly without thrashing around. Don’t try to kill the lobster beforehand. 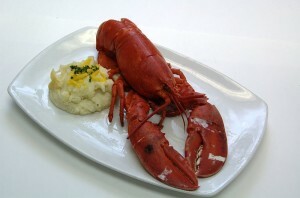 If you cut the shell, you will release proteins into the water and spoil the lobster meat as well as destroying the roe. This is a delicacy that is not to be missed. Cover the pot and return the water to the boil, waiting for around 15-20 minutes depending on size. A one to one and a half pound lobster will take 15 minutes to cook. Always add a bit if you are unsure as undercooked lobster is terrible but it takes a really long time for it to become overcooked. Remove the lobster and replace it on a drainer, making sure you have something to catch the water than will drain out. The lobster is then ready to be picked apart and eaten. Lobster Risotto is a dish that uses both the meat from the lobsters and the shells. You can make the lobster stock before hand or substitute it for a chicken stock or even water. Stick to short grained rice for the meal, which serves 4-6 as a side dish or appetizer. Chop half of the lobster meat finely. Crush the saffron into the white wine and give it a good stir. In a heavy, medium sized pot, heat olive oil on a medium heat and sauté the shallots for 2-3 minutes but stop before they are coloured. Add the garlic and the rice then stir well. After a minute, add the finely chopped lobster meat, ¼ tsp of salt and the white wine with saffron. Stir and bring to the boil. Make sure you stir frequently around every 90 seconds and let the wine boil down. Turn to a medium heat and add the lobster stock ½ cup at a time, keeping stirring. When the rice is al dente, add the rest of the lobster meat and the parsley then add salt if needed. This meal is perfect if accompanied by a white wine. Recommendations include a Sardinian Vermentino or Sicilian Grillo but an uncorked Chardonnay, white Cotes du Rhone or an off-dry Riesling would work equally well. This is just one simple idea how to use the meat from your cooked lobster and there are hundreds of others just as mouth-watering. Whether you want a simple dish or something complicated for a main course or appetizer, lobster is a very easy to use seafood and once you have learned how to cook a lobster, there are countless dishes open to you.